FloppyServer is a file storage library. There is also FloppyClient library and symfony2 bundle that adds few integration points to symfony2 applications. When your application uses images and other files intensively, there is a problem with generation required thumbnails, code to handle file upload is full of boilerplate, dealing with files is awkward. There are very good bundles to Imagine that partially resolves first problem, but not other problems. This documentation covers only FloppyServer library, if you want to see how to use FloppyServer from the client side, check FloppyBundle and FloppyClient libraries. FloppyServer is able to do some extra processing on uploaded file. It is able to resize large images before store it to storage and execute various optimizations on images thanks to ImageOptimizer library. Resizing images greater that Full HD size is enabled by default, but other optimizations are disabled and you could enable it manually thanks to fileHandlers.image.enableOptimizations option. Be aware of that, image optimizations could be cpu extensive, however default optimizers are as lightweight as possible. Floppy supports applying filters on files, especially on images. Original, optimized files are stored in storage, but it is possibility to generate different version of the file on the fly when users are requesting for the file. Different version of the file could be thumbnails, images with watermark, cropped images and more. See FloppyClient docs for more details about filters, supported filters are similar to filters from LiipImagineBundle. After generating thumbnail or other version of the file, it is cached and on the next request for the same version, file would be fetched from cache, so processing is done once. 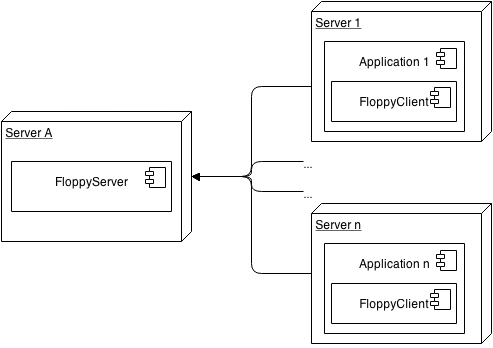 FloppyServer is designed to handle multiple clients, so you can setup one instance of FloppyServer and use it in many applications. This library is fully customizable and extensible, you can define what file types can be stored, what file types would be processed before sending to client (for example generating thumbnails, adding watermarks etc), what file types would and how to be optimized, what security credentials would be required to upload / download files and more. CORS / crossdomain.xml / clientaccesspolicy.xml are supported by adding simple entry into configuration so you can upload to FloppyServer directly from web browser even if FloppyServer instance is running on different host than your app. There is also nice symfony2 integration (see FloppyBundle documentation), so uploading files and using files in application is very simple and elegant. To create your floppy server application you should create empty composer project, add dependency to floppy/server package and create following index.php file. Virtual host should be created in web directory, storage will be in web/../storage dir. firewall - deny or allow to execute certain action, you can restrict for example access to upload action to certain ip address. By default there are no firewalls so everyone is able to upload files. security rules - more specific and customizable security rules, you can take decision to grand or deny access to action having information about accessed file, extra information provided by client etc. FloppyServer uses Pimple2 library as dependency injection container, so $container variable in Closure param is Pimple instance. "expiration": date().timestamp + 60, "some-custom-attr": "custom-value"
If you want to add extra security attributes, you can extend PolicyRule and add support for your extra attributes, for example user id etc. There are two file groups by default: images and other files. Images has its own FileHandler that adds support for processing before storing and sending file to a client. If you want to create your own files' group you should create Floppy\Server\FileHandler\FileHandler implementation (Floppy\Server\FileHandler\AbstractFileHandler implements the most part of file handler). FloppyServer can be setup in few ways, there are 4 recommended setups. Before reading this section read Simple setup example section, because it says how composer.json and index.php files should to be. The idea is to put your storage directory to public directory and configure htaccess to fallback requests to unexisting files to your index.php file. This is the most efficient way to setup Floppy. When requested thumbnail exists (because it was generated in the past) server directly send file without running php code. When thumbnail is missing, it will be created by FloppyServer. The alternative is to setup FloppyServer in non-public directory and adds x-sendfile (or nginx replacement) support to gain performance. If you have no x-sendfile mod on your webserver, you should use configuration from Simple setup example section. It will be working but would be inefficient. You can also setup your floppy server to store files in two root directories. One of those directories should be non-public. Client that is uploading file says whether file should be stored in public or non-public directory.